Davis: I work for a wonderful non-profit that’s a hub for librarians, archivists, and museums where we focus on the nexus all kinds of different library types. Back in 2014 when Ray was seriously considering editing a collection of essays on the topic of librarians who haved moved between and among all the different kinds of libraries METRO works with, I was happy that he thought of asking me to join him. Even better, I was able to invite a few of the members of our community to join in by writing for the book. 2. Why did you work on this book? What were some challenges in putting together an edited volume? Ray: Back in 2013, I made my own transition from public to academic librarianship. It was interesting because I also had a job offer from a special library too but I turned down the offer. I started reflecting on this period of transition and I tried finding articles, essays or anything I can get my hands on about library transitions but there was nothing available. 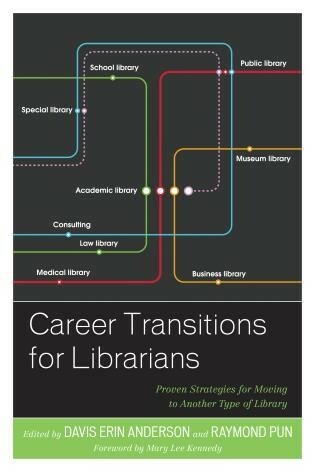 Soon, I wrote a blog post about it for ACRL and started seriously thinking about putting together an edited volume on career transitions. 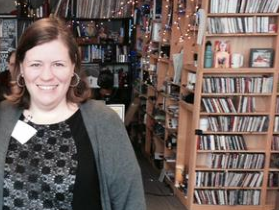 I knew Davis back in 2012 when we were in nominated as Library Journal’s Mover and Shaker in 2012. I am a big fan of her work at METRO since we worked on some other projects before too. I identified her as a strong potential partner for this project. We met up for coffee when I was visiting NYC from Shanghai one day in June, and I told her about this project and she agreed! Davis: And I was thrilled to have been invited to collaborate on the project! The challenges we faced were immediately evident: who do we know has made a transition between sectors within the field? Would they be interested in writing for the book? Could we cover all of the various routes one could possibly take during their career? Fortunately Ray is very connected and we had no trouble filling the ranks! But then a very different challenge emerged: what’s the best way to organize our work? How do we keep close track of the progress we were making from inviting authors to contribute to ensuring both of us read and offered helpful suggestions to our authors? It was a lot to track! 3. What are some of your favorite stories and advice from the book? Davis: It’s impossible to choose a favorite! For both of us, I think, it was critically important to make sure all of our authors were represented on their own terms and in their own voice. And I’m pleased to say that the advice that emerged was both central to the story of each and every one of our authors and interview subjects while being applicable to others who are looking at perhaps exploring the field a bit more through a career move. Ray: So we had 40 stories and interviews in this book – I have to say I am interested in hearing how people took risks to accomplish what they set in mind. Librarians leaving academic librarianship is a good example – we have several of these narratives. Some might think that academic librarianship as the “golden model” of all librarianship but in reality, that type of librarianship may not be the “right” fit for everyone. Sure, it would be awesome to help students and faculty with research, access a million databases, work in a great university or campus; conduct your own research; publish; present; have professional development funds for conferences. But in reality, it could be overwhelming or underwhelming. We have a few stories in our book that focus on how academic librarianship did not work for some librarians – and that’s OK. I think for them to say that they tried very hard to make it work speaks volumes to our profession: we work really hard to help our communities and build ourselves in the process but when it doesn’t work, it’s time to move on and refocus. And it worked out for them. It wasn’t always easy but it’s doable and inspiring. For me, the best advice is to network strategically. You want to be in academic librarianship? Join ACRL and get involved. You want to move into special librarianship? Join SLA and volunteer. Public librarianship? Join PLA and sign up for committees. There are opportunities out there for you to get involved. Sure, it could be an expensive but it’s an investment to your future to consider how these opportunities can get you to where you want to be. Also we featured, you, (Naomi House, Founder of INALJ, this blog, you are reading right now!) on your own career transitions and it was very interesting to hear her thoughts on it! 4. What are some unexpected new challenges in transition that you can share? Ray: That’s a hard one. I would say that people didn’t think it would take a very long time to make that transition. Some stories revealed that it took some time to understand how another type of library operates. We all share the same information ecosystem but we may operate in different institutional, cultural or strategic contexts and that can take a while to learn and understand. You’d have to really do some research, talk to some people and hear from different perspectives on how these transitions took place. We wanted to cover internal academic transitions as we know that some people wanted to move from one type of section into another and that isn’t easy as well: moving from technical to public services; taking on new disciplines such as engineering or learning new areas in the field such as digital humanities. Davis: One of the questions we asked many folks to address was whether they felt that selecting one particular lane within the field — be it academic, public, specialized, and so on — meant that they felt they needed to stay in that particular lane. As predicted, we received a variety of perspectives on this topic, and the results were fascinating! Some of our authors and interview subjects felt that yes, we do face obstacles when attempting to shift directions, even when it’s just within our field. Others pointed out that our work is transferrable. We can take a look at the commonalities we share and provide a good narrative of how our qualifications are well-suited to making the jump. That was encouraging to read. 5. Other thoughts you’d like to share? Ray: Our book is available for sale and interlibrary loan! Get your library (or library school if you are a student) to purchase a copy! The essays, narratives and reflection pieces will give you a glimpse of how diverse our profession is: from museum libraries to corporate libraries to school libraries – our profession thrive because of amazing people who take risks, share their experiences and mentor others too. For library school students, don’t feel you should specialize in library school (in my opinion). If you don’t know what area you want to cover, try everything, experiment and intern – you are bound to unlock what you are interested, build on that experience and perhaps you may want to move on to another path! Davis: I’d like to express my gratitude for Ray and all 40 of our authors and interview subjects. I am really proud that we are featuring stories from folks who are new to the field as well as those who are more seasoned. These stories circle the globe, and we’re proud to highlight individuals who are doing cutting-edge work in our field. It was a wonderful experience to get to know so many new people through this project! And yes, you can pick your copy up via Rowman Littlefield and via Amazon! Thank you!